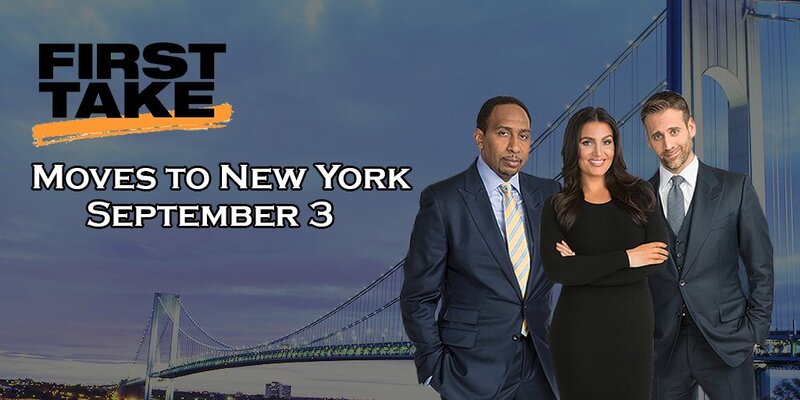 First Take – with featured commentators Stephen A. Smith and Max Kellerman, and hosted by Molly Qerim – will permanently move to ESPN’s New York Seaport District Studios. The debut will showcase an updated look, while bringing all of the analysis and debate that viewers know and love. Production for the program will continue out of ESPN’s Bristol, Conn., headquarters. Additional details about the September 3 debut will be released later. First Take airs weekdays from 10 a.m. – Noon on ESPN. The program is regularly one of ESPN’s highest-rated shows and consistently is the No. 1-ranked cable network from the 10 a.m. – Noon ET timeslot. By the way co-host Molly Qerim just married former NBA player and Get Up host Jalen Rose.